The Missing Adventures were a range of books that began in the nineties and where the first to showcase the previous doctors. Up to that point the only Doctor in the form of fiction had been the Seventh in adventures designed to have continued on from the end of the television series, Survival. It was with The Missing Adventures that various authors dug around in Doctor Who's long past and found elements of stories that had been left dangling or were ripe for a sequel. One of these stories was The Pyramids of Mars and author Justin Richards creates a highly enjoyable story mixing Victorian London with Ancient Egypt, mad priests and mummies and The Fifth Doctor, Nyssa and Tegan becoming embroiled in an attempt to resurrect an ancient Egyptian god. This time however, it is not Sutekh but his wife and sister, Nephthys who wants to take over the world. While Nyssa is kidnapped and doomed to become reincarnated evil, the Doctor and Tegan travel to have tea and biscuits with Lord Kenilworth before embarking on a mission to save not only Nyssa but the entirety of mankind! This is a great novel! Richards understands that he isn't withheld by the boundary's the show had to contend with and we get a novel where the Doctor travels between ancient Egypt and Victorian London with the pace we would want him too. If this story had been on television it would have been confined to one location and it wouldn't have worked but this novel is not like that, it is highly enjoyable and we get to see the possibilities of time travel used to great effect! It is a great credit to the author that the many locations don't hinder the progress of the story. Indeed it rattles along at such a pace that there is barely time to breath and that only adds to excitement of the entire book. And throughout the novel, no matter where in time we are deposited, the threat of the Osiran's is constantly maintained. However, it does face the problems that any sequel has to face. It doesn't stand up to it's predecessor. While, in my opinion it is a successful sequel the original managed to mix Edwardian and Ancient Egyptian elements masterfully but Richards doesn't quite mix the Victorian Gothic elements into it too well. I think that perhaps the many different time travel sections worked against him. While they are certainly enjoyable, we don't linger enough to fully appretiate Victorian London, although I do enjoy the scene in during the excavation in Egypt where the Mummies attack the Doctor's party's camp. It is good to see the return of the Osiran puzzles we saw in episode 4 of Pyramids and while these are not actual riddles like the last time it is nice to see happen inside an actual pyramid instead of a prison on Mars. On the whole Richards takes the strengths of the 1975 serial and uses them to good effect but what he doesn't do is give us a good hero/villain pairing. With Pyramids we had the Fourth Doctor and Sutekh, a Time Lord and a mad God both engaged in a battle of wits. The Time Lord who walks through eternity versus the Osiran's gift of death. 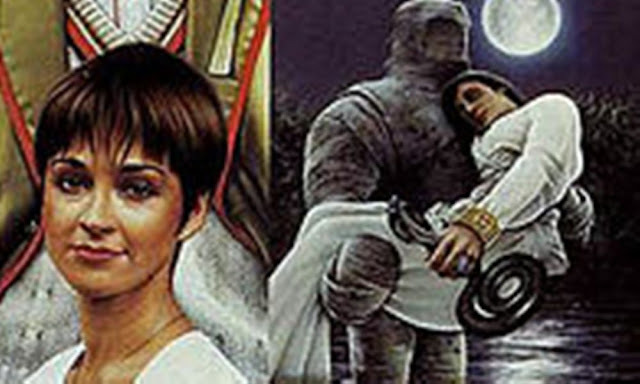 I feel that the pairing of the Fifth Doctor and Nephthys could have been brilliant and it is a shame that it wasn't. Both characters are evidently younger than their predecessors but with the younger hero, Richards portrays him as someone in control, unlike the Fifth Doctor we see in Fear of the Dark. The confrontations between hero and villain are kept to the bare minimum and the character of Rassul does rather impede what should have been a satisfying finale. As we should expect from this competent author, the characterisations are pitch perfect. Nyssa is unfairly sidelined which is a great shame but she does make way for the fabulous character of Atkins, a Victorian Butler who is not overplayed or overstated but a character that develops well over the course of the story. Stock characters like Lord Kenilworth and Vanessa Pryor are brought satisfyingly enough to life for the duration they are needed and while Richards doesn't flesh out the TARDIS crew as much as other authors would do or had done, he does allow Tegan a few moments to have a couple of drinks! THE SANDS OF TIME WRITTEN BY JUSTIN RICHARDS WAS RELEASED BY VIRGIN BOOKS IN MAY 1996.